Let’s talk about the only “market timing” strategy that actually works in practice – buying a stock before it announces a dividend hike. In a minute, I’ll show you seven stocks that are likely to announce generous hikes next time they talk to Wall Street. Their stock prices will then follow their payouts higher in the ensuing months. 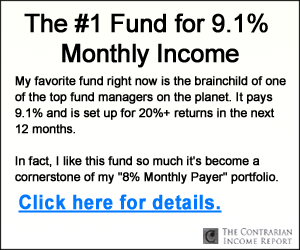 This “undercover income strategy” is the closest thing to a sure thing you’ll find in the financial markets. Everyone loves the dividend, but investors usually don’t give enough love to the dividend hike. Not only do these raises increase the yield on your initial capital, but also they often are reflected in a price increase for the stock. Biotech stocks aren’t the first, second or third name in the income game, but one or two stocks are exceptional exceptions. 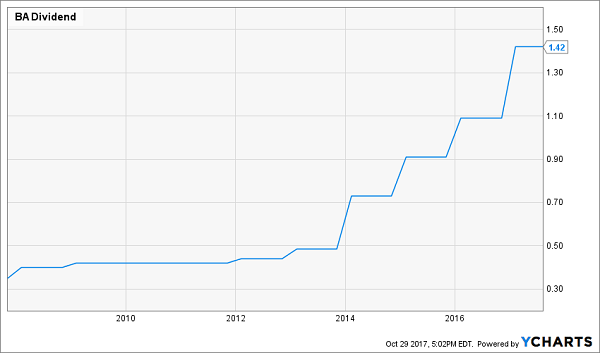 Take Amgen (AMGN), which has more than tripled its quarterly payout in five years, from 36 cents per share in 2012 to current levels at $1.15. That’s because Amgen is no fly-by-night biotech small-cap that lives and dies by trial results for one or two candidates. AMGN operates in approximately 100 countries, and boasts 16 products already approved in the U.S. – and that’s not to mention its robust pipeline of 33 clinical and pre-clinical treatments. Amgen grew its top line once again last year, to nearly $23 billion, that delivered a tidy $7.7 billion profit. And Amgen uses its growing earnings to fund stark growth to its quarterly payout. Expect the next increase to be announced sometime in mid-December, though the dividend itself won’t be paid until February of the following year. 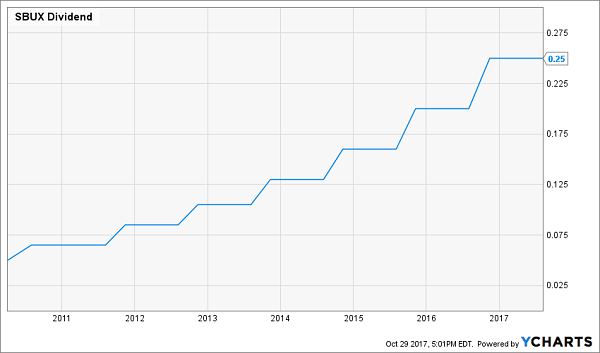 Aerospace and defense giant Boeing (BA) has, as mentioned, already given shareholders a 2017 they won’t soon forget. BA shares have climbed more than 60% year-to-date, powered by good, old-fashioned operational excellence. The company has posted three earnings beats through three reports this year, and that included a record 202 aircraft deliveries in its third quarter reported in late October. That Q3 report also included an upgraded forecast for free cash flow (from $12.25 billion to $12.5 billion) and earnings (from $11.10-$11.30 to $11.20-$11.40). 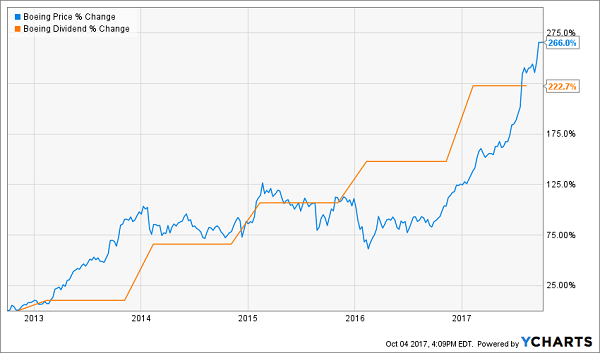 Boeing should share some of that extra wealth sometime in mid-December, when the company traditionally announces its annual dividend hike. Investors can only hope this year’s increase is like last year’s, when it ratcheted up the payout by 30%. 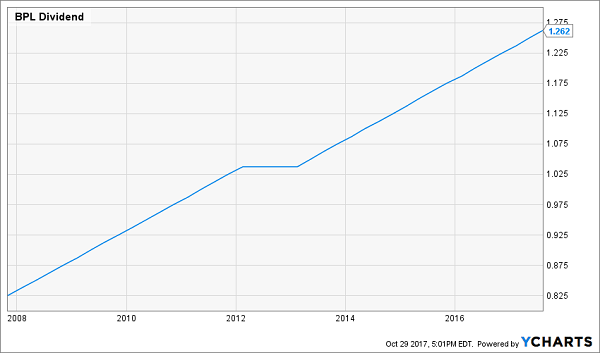 Will Boeing (BA) Deliver Another Dividend Gem for the Holidays? Buckeye Partners LP (BPL) is a pipeline master limited partnership (MLP) largely dedicated to transporting and storing liquid petroleum products, boasting some 6,000 miles of pipeline. But what makes BPL truly stand out is its dedication to distribution increases – the company has upped its payout on a quarterly basis since 2013, and likely will do so again Nov. 3 alongside its third-quarter results. Just don’t expect much. The scale of BPL’s distribution improvements has slowed to a near-crawl, and likely will underwhelm again given the MLP’s disappointing year; shares are off more than 20% so far amid a downturn in profits. Cedar Fair LP (FUN) is the company best known for Ohio’s Cedar Point – the world-class thrill park whose coasters frequently rank among the tallest, fastest and/or longest in the world. However, it also is responsible for parks such as Kings Island, California’s Great America and Knott’s. Cedar Fair is among the beneficiaries of the growing “experience economy,” in which Americans have become more interested in going out and experiencing the world than simply accumulating stuff. 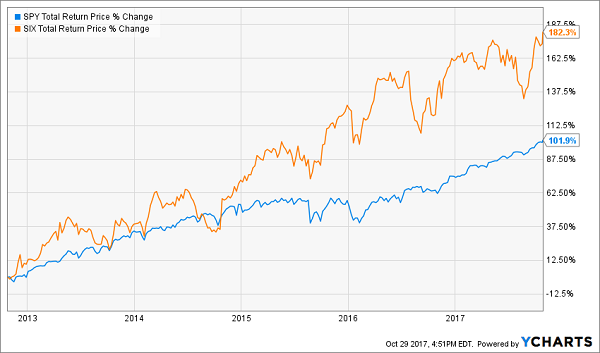 Between continued growth and a considerable distribution, FUN shares have actually outpaced the S&P 500’s total return over the past five years. Cedar Fair has more than doubled its distribution since 2012, from 40 cents quarterly then to 86 cents now. That payout should get even larger in early November, when the company typically unveils a higher number. Six Flags (SIX) looks a lot like Cedar Fair in that it’s an amusement park-related operator with an attractive yield. It currently boasts 20 parks across the U.S., Canada and Mexico – most of them either Six Flags-branded or joined water parks – and has plans to open three branded parks in China. 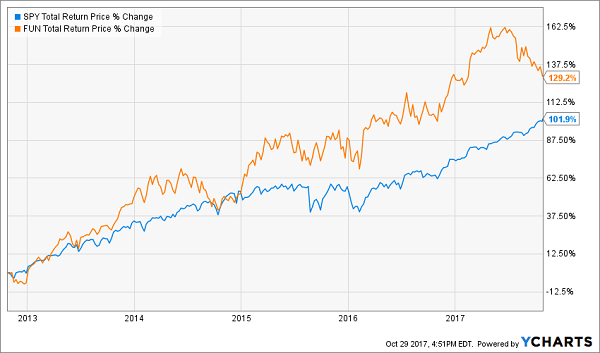 And like Cedar Fair, Six Flags has pummeled the S&P 500 on a total return basis over the past five years. But SIX and FUN have a few important differences. Most notably, Cedar Fair is a limited partnership that pays distributions, and thus requires the complicated K-1 form come tax time; Six Flags is a traditionally structured business with simple dividends. On the flip side, Six Flags’ payout growth hasn’t been as substantial as Cedar Fair’s, with a 42% improvement to the dividend since 2012. Still, investors should be on the watch for a fresh hike to be announced sometime early in November. America’s coffee king, Starbucks (SBUX), is in dire need of a little caffeine. Shares are down 13% since 2015 amid continued growth concerns – and yet at the same time, the stock still can’t shake its perpetual state of being overvalued. SBUX trades for more than 23 times forward earnings right now, which is more expensive than the also-frothy S&P 500 (nearly 20), and estimates for roughly 15% earnings growth don’t really justify the premium. 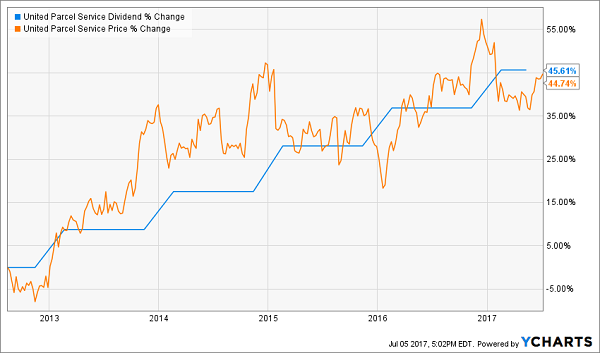 However, another dividend boost like Starbucks doled out in 2016 might stay a few hands that are ready to sell. The company hiked its quarterly payout by a whopping 25% to 25 cents per share. Investors should find out how much more SBUX will pay out on Thursday, Nov. 2, when the company announces its results for the full fiscal year. Will Starbucks’ (SBUX) Growth Problems Extend to Its Payout? 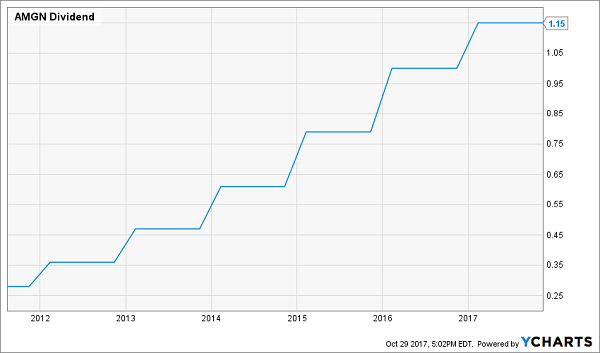 Universal Corp (UVV) is, like other tobacco stocks, a good yielder that’s surprisingly resilient despite the country’s continued, longstanding crackdown on tobacco products. But it’s also unlike other tobacco stocks. Universal is instead a buyer and seller of tobacco, so rather than competing with the likes of Altria Group (MO), it actually counts the parent of brands like Marlboro and Parliament among its customers. UVV shares haven’t enjoyed a boffo 2017, down about 10% with just a couple months to go in the year. However, Universal is a dividend raiser in good times and bad, including clockwork penny-per-share hikes since 2006. Universal’s announcement typically comes sometime in the first half of November. As much as possible. 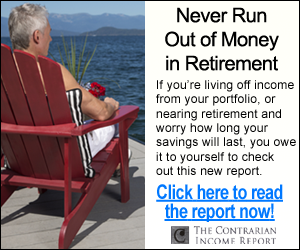 This strategy is such a “slam dunk” for investing returns that there’s no reason to collect more current yields than you need right now. 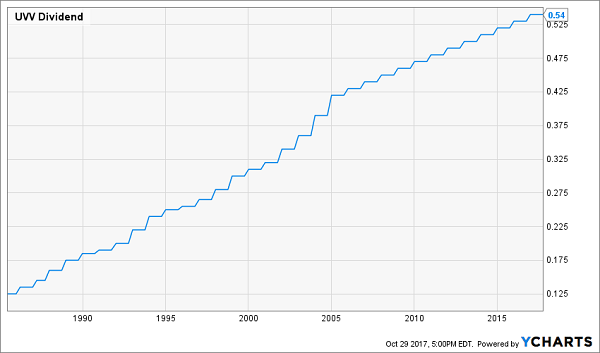 If you can “forego” some amount of income today, I would encourage you to consider investing that capital into dividend growers.